Another pound gone! 22 down, 26 to go! You're back in business Chuck! I admire your tenacity!! This warm weather is encouraging me to eat right! Yesterday I ate a granola/plain yogurt/berry/banana parfait for breakfast, a vegetarian flatbread sandwich and a cup of fruit for lunch, and for dinner I had two bites of tuna, a half avocado, some lettuce, and some seeds and nuts. For dessert, I ate a small slice of home-baked rhubarb pie! Today I had another parfait for breakfast, only instead of granola, I had grape nuts, or what my husband calls "pea gravel". I find it very delicious! There was a Health Fair at work with free lunch, so I had a chicken "sloppy joe" with an ear of corn, beans (yay! ), cole slaw, and 1.5 oz of chips. For dinner, I drank a raspberry ice tea. I went to help my friends move a concrete block wall (it was mostly just cheerleading) and then stopped by my mom's, who pressed on me some potato salad, jello, and cashew cookies. On the way home, I ate two of the cookies. The rest of the food went in the fridge for my son. Hope that everyone is doing well today!!! Another pound gone! 1 more, and I'm at the halfway point! Congrats to Chuckie on reaching his halfway point! Meanwhile, I lost another 8, so I have reached my goal!!! Big Brother Paul! Congrats on reaching your goal!!! That's great! 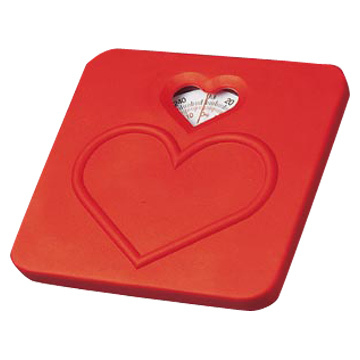 BTW, the scale with the heart on it, isn't that just so positive? Well, I almost reached my halfway point, and had one pound to go, and gained 5 ounces over the weekend. I'm glad I was careful and didn't undo all my hard work! I should be back down to 210, and then officially at 209 (and halfway point) soon! Sticking to a diet during Brokie weekends, with all the chowing down, sure is challenging. I feel like I ate nothing but oysters! Chuck, you're a wonder. Congrats on sticking to it!